With the holidays fast approaching, the Nintendo Switch is much easier to find in stores right now than it has been for most of 2017. In fact, it’s in stock on and off constantly on Amazon these days, so keep your eye on this page. 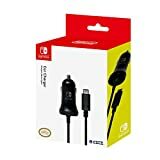 Now that so many more people have gotten their hands on a hot new Switch over the past month or so, it’s time to dive into five must-have accessories that you’d be crazy to own a Switch without. 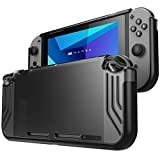 HIGH QUALITY CASE – High Quality Durable hard shell Protect your Nintendo Switch Console free from scratches. A Velcro secures the Switch inside the case (We have replaced two elastic straps with a Velcro,It is a lot easier to put in and take out the Switch with a Velcro), make your switch more stable and convenient when you’re traveling or not using. UNIQUE ZIPPER HEAD DESIGN – We use High Quality Nylon Zipper Head, not like the other case’s Iron Zipper Head will scratch your precious switch（We show this contrast in the 5th picture）. Zipper ensures your small items do not fall out. 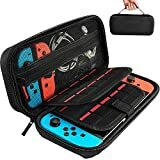 LARGE STORAGE – A large zippered mesh pocket provides secure storage room for some small Nintendo accessories like small Charger, charging cable, slim power bank, ear buds, and 2 extra Joy-Cons, Easier to Close and Easier to Carry. It also build with 20 game card slots, allowing you to carry and change your favorite games anytime & anywhere.